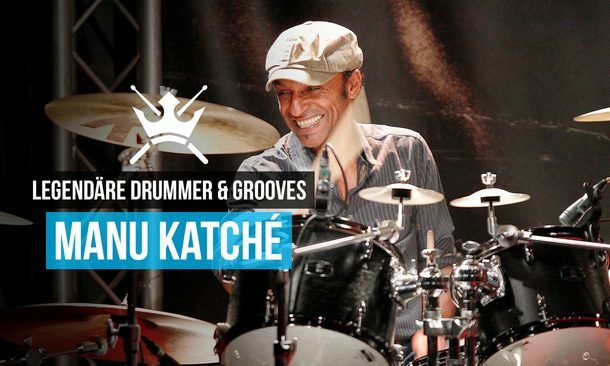 This third edition of my little workshop-series “legendary drummers – legendary grooves” – exclusively for bonedo drums – is dedicated to another true drumming hero of the eighties and nineties: Manu Katché, french top-player with westafrican roots. Manu has proffered quiet a few legendary grooves to the world in the course of the years, for example while working with Peter Gabriel, Sting, Dire Straits, or for the 1987 Song “Somewhere Down The Crazy River”, a release on selftitled Album “Robbie Robertson”. For the dark, atmospherical track, Katchè created a dense, mysterious Groove, which leaves a heavy impact on the composition and stronly shapes it`s overall appearance. The creative combination of tom-accents, snare-off-backbeats and touchy ride-bell-work casts a spell over each groove-loving listener. When I heard “Somewhere Down The Crazy River” for the first time many yeras ago, i was instantly drawn to it`s unique feel and was really intrigued. In this bonedo-workshop you will find, as usual, transcriptions, simplifications and re-recordings by your’s truly, which should hopefully help making this extraordinary beat more transparent and explain, how Manu built the legendary groove. Have fun checking out another drumming masterpiece!